Special Discounted Price for limited Period. 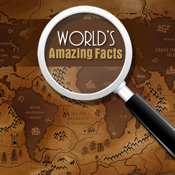 This application provides some of the unknown interesting, cool, incredible and strange facts, which we normally does not know. It's a unique collection of such facts and data of more then 450+ things, which you should really know which is generally not known to us. - Share the facts with your friends via FB and Twitter.